The Cangin [ˈtʃaŋin] languages are spoken by 200,000 people (as of 2007) in a small area east of Dakar. They are the languages spoken by the Serer people who do not speak the Serer language (Serer-Sine). Because the people are ethnically Serer, the Cangin languages are commonly thought to be dialects of the Serer language. However, they are not closely related; Serer is closer to Fulani than it is to Cangin. Safen, or Saafi-Saafi, the language of the Saafi people. Spoken inland from the Petite Côte, an area southeast of Dakar. The largest Cangin language, with over 100,000 speakers and growing (2007). Lehar (Laalaa), the language of the Serer-Laalaa (or Serer-Lehar), spoken in a small area north of Thiès. Noon, the language of the Serer-Noon, spoken around Thiès. Palor, the language of the Palor people, spoken in a small area between Rufisque and Thies. 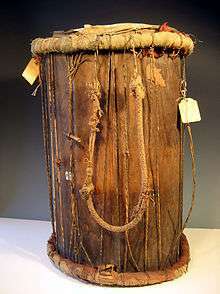 Ndut, the language of the Serer-Ndut people, spoken in the Mont-Roland, an area northwest of Thies and in the Kingdom of Biffeche on the Senegal River. Lehar and Noon are particularly close, as are Ndut and Palor, though not quite to the point of easy intelligibility. Safen is transparently closer to Lehar–Noon than to Palor–Ndut. ↑ Hammarström, Harald; Forkel, Robert; Haspelmath, Martin; Bank, Sebastian, eds. (2016). "Cangin". Glottolog 2.7. Jena: Max Planck Institute for the Science of Human History. This article is issued from Wikipedia - version of the 8/30/2015. The text is available under the Creative Commons Attribution/Share Alike but additional terms may apply for the media files.